Chicken menudo tomato based dish and a variation of pork menudo and resembles chicken afritada because of one ingredient, the bell peppers. Pork menudo doesn’t have bell peppers. Cooking is almost the same on the dishes I’ve mentioned and it is easier. One advantage of cooking chicken dish compared to pork dishes is the shorter time needed to cook it. Chicken is also healthier compared to pork. 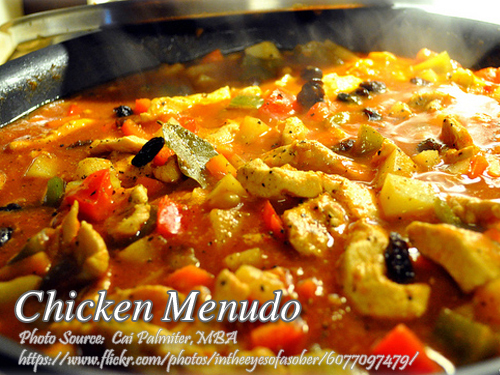 In cooking this chicken menudo, if you don’t like to include chicken liver, you can use liver spread. In the pork menudo dish, it is tastier to include the pork liver so the same thing as in chicken menudo. Chicken menudo tomato based dish and a variation of pork menudo and resembles chicken afritada because of one ingredient, the bell peppers. In a large bowl, marinate the chicken breast in calamansi and soy sauce for at least 10 to 20 minutes. Set aside. In a pot, heat some cooking oil and fry the potatoes and carrots until light brown. Set aside. In the same pot, saute garlic and onion until the fragrant and soft. Add the chicken and saute for at least 2 minutes in medium low fire. Add water and laurel leaves and bring to a boil. Remove the scum floating on the broth. Then add the chicken liver, tomato sauce and ketchup and stir. Simmer for at least 10 minutes. After 10 minutes, add the green peas, bell peppers, carrots, potatoes, hotdogs, raisins, salt and pepper. Simmer again for 5 minutes stirring occasionally. Serve hot. Amazing, i love your recipe thank you so much… Godbless! Hi Babylen, thanks for visiting the blog and for the kind words. Godbless you too! Hi Kylen, thanks and God bless you too. Hi Ellen, You are welcome!